TDK Life on Record Ultrium LTO data cartridges are designed and thoroughly tested to ensure they function as seamless extensions of your organization's data network. Formulations and advanced manufacturing technologies ensure stable head contact for increased data transfer rates and the preservation of your organization's critical data. To aid in both video and archive systems, TDK LTO 5 media is compatible with Long-Term File System (LTFS) and other partition ready applications. 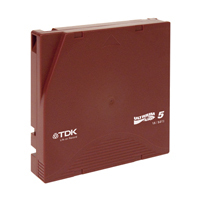 A single LTO 5 tape cartridge features 1.5 terabytes of native capacity and 3.0 terabytes of compressed capacity with data transfer rates of 280MB/second (2:1 compression). To meet this capacity requirement and still ensure the same long archive performance our customers know and trust, TDK LTO 5 media is made with new and smaller magnetic particles coated on longer, thinner media.